My caption: Lonnie Cole, 11 years old, Village of Avondale, Birmingham, AL, November 1910. Photo by Lewis Hine. Lewis Hine caption: “OUR BABY DOFFER” they called him. Donnie Cole. Has been doffing for some months. 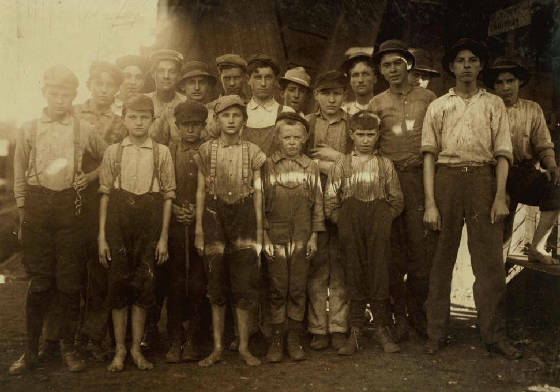 When asked his age, he hesitated, then said, “I’m Twelve.” Another young boy said “He can’t work unless he’s twelve.” Child Labor regulations were conspicuously posted in the mill. Location: Birmingham, Alabama, November 1910. My caption: Lonnie Cole, Birmingham, Alabama, November 1910. Photo by Lewis Hine. 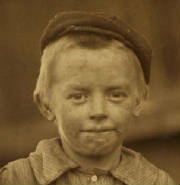 Lewis Hine caption: “OUR BABY DOFFER” they called him. This is one of the machines he has been working at for some months at the Avondale Mills. Said, after hesitation, “I’m 12,” and another small boy added, “He can’t work unless he’s twelve.” Child labor regulations conspicuously posted in the mill. Location: Birmingham, Alabama, November 1910. Avondale Mills opened in 1897. Its founder and first president was Braxton Bragg Comer, a cotton farmer and businessman. It was built in Avondale, a neighborhood in Birmingham. Other mills were opened in Alabama as the company expanded. Within a year, the Birmingham mill employed more than 400 people. In 1906, Comer was elected governor of Alabama, but continued to serve as the company’s president. The cotton mill was strongly criticized by social activists for their child labor practices, and for opposing legislation to restrict such labor. One investigation in 1900 showed that about 25% of its employees were between the ages of eight and fifteen. The company ceased operations in 2006. A detailed history of the mill and its working conditions can be found in the Encyclopedia of Alabama. See the link at the end of this story. The task of a doffer was to replace the bobbins on the ring bar, remove the bolts of yarn, and replace the spindle with empty bobbins. Typically, the room would fill up with lint, getting in the workers’ lungs and all over their clothes. Children were chosen for this repetitive job because it required only practice and a good pair of small hands. A year before little Lonnie was photographed, Alabama passed a law setting the minimum age of a child worker at 12, and limiting the maximum hours a child could work per week to 60. Lonnie was just 11 in the photographs, so he was under the legal age. In 1915, the minimum age was raised to 14. My caption: Lonnie Cole (front left), Birmingham, Alabama, November 1910. Photo by Lewis Hine. 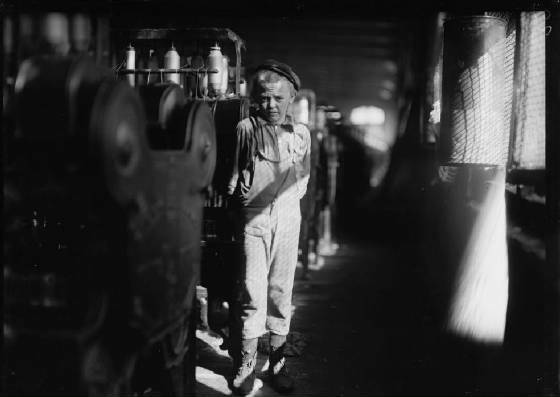 Lewis Hine caption: “OUR BABY DOFFER” and some of the other infants all working in Avondale Mills. Location: Birmingham, Alabama, November 1910. 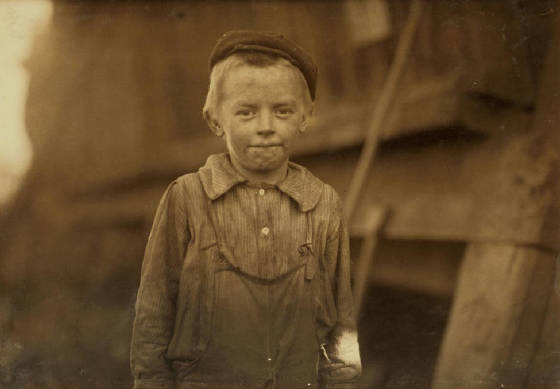 Lewis Hine had a knack for finding a sympathetic face, and for coaxing a child to look directly into the camera. How can we not care about this boy? When I saw the photo, I dropped everything and went to work. But I ran into trouble right away. There was no Donald (or Donnie) Cole listed in the Birmingham area in the 1910 census. The only possible Cole family had a 12-year-old boy listed as Lammer Cole, along with his mother, father, and seven siblings. The 1920 and 1930 census didn’t turn up anything very helpful either. Back to the census, I found a Lonnie Cole in Alabama in 1930, with about the same birth year, the same father and two of the same siblings as the Lammer Cole I had found in the 1910 census. Then I found the same Lonnie in the list of WWI draft registrations, then Lonnie’s Social Security death record. He died in Birmingham in 1975. I requested his obituary from the Birmingham Public Library. After finding his sister Velma in the 1920 census, married to Homer Holcombe, I found her death record and her obituary online. Among her survivors was her daughter, Dorothy Cheatham, of Florida. I mailed her the photo. A few days later, she called back, telling me how thrilled she was to see the photo of her Uncle Lon. My caption: Lonnie Cole (front center), Birmingham, Alabama, November 1910. Photo by Lewis Hine. Lewis Hine caption: “OUR BABY DOFFER” and some of the other doffers all working in Avondale Mills. 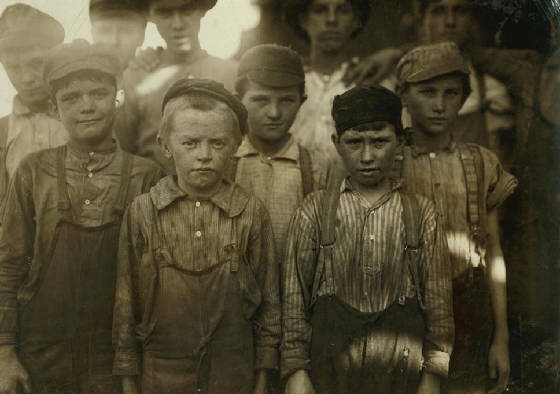 Location: Birmingham, Alabama, November 1910, Lewis Hine. Hine photo of Lonnie, including Hine’s caption, was published in The Montgomery (Alabama) Advertiser on March 16, 1911, four months after Hine photographed him. It was probably published at the request of the National Child Labor Committee. 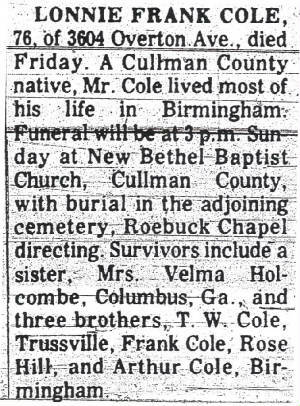 Lonnie Frank Cole was born in Cullman County, Alabama, on March 7, 1899. His parents were John Frank Cole (known as Frank) and Lola (or Lora). They were from Georgia and had married in 1893. Frank was a farmer. In the 1910 census, Frank wife’s is now Rachel (later identified as Grace), and there are four more children in the house. They married about 1904, so we can guess that Lonnie’s mother Lola may have died. Frank is a well driller, and none of the children are listed as working. Lonnie doesn’t appear in the 1920 census, but his father and stepmother do. Frank is still a well driller. In the 1930 census, Lonnie is back home, working for his father as a well driller. Lonnie passed away in Birmingham on his birthday, March 7, 1975, at the age of 76. He never married. Edited interview with Dorothy Cheatham (DC), niece of Lonnie Cole. Interview conducted by Joe Manning (JM) on October 14, 2009. JM: How are you related to Lonnie? DC: He was my mother’s brother. My mother was Velma Jewel Cole. DC: 1921, in Siluria, Alabama. JM: When you were a child, did you live close to Lonnie? DC: Not real close. We lived in the same county. JM: How often did you see him when you were a child? DC: When I was growing up, I saw Lon a good bit. He’d come to the house and maybe spend a night or a day, and then he’d be on his way. Sometimes he’d stay three or four days and sort of hang out with the family. We all called him Lon. That’s what I called him – not Uncle Lon – just Lon. JM: Was he working then? DC: He worked off and on in the cotton mills. His health was bad. He had a lung problem, so he wasn’t able to do a lot of work. JM: What was he like then? DC: When he came to visit, he would entertain the kids. He was just kind of an everyday guy. He was a very congenial person. Everybody liked him. JM: How did he support himself when he wasn’t working? DC: I think he drew some kind of supplement from the county, and he also stayed a lot with his parents, or with my mom. JM: Did you know his parents? JM: Did he ever marry? JM: Did you continue to live near him when you grew up? DC: When I married, I moved away from the family. I spent some time in Michigan during the war (WWII). Then we moved to Mississippi. During that time, I didn’t see Lon much. There was a spell when he was staying with my mother in Columbus, Georgia. My husband and I lived there for a while, so we spent some time with Lon then. JM: Other than being older, was he any different from the way you remembered him? DC: Things hadn’t changed much. He wasn’t working. Mostly, he was staying with family. JM: Was the family really good at watching out for him? DC: Yes. Everyone loved him. JM: What was lovable about him? DC: He was just a very easygoing person. When he was around, all of the kids loved to be with him, because he would play with them and joke with them. And he would help with the chores. He was an all-around good person. 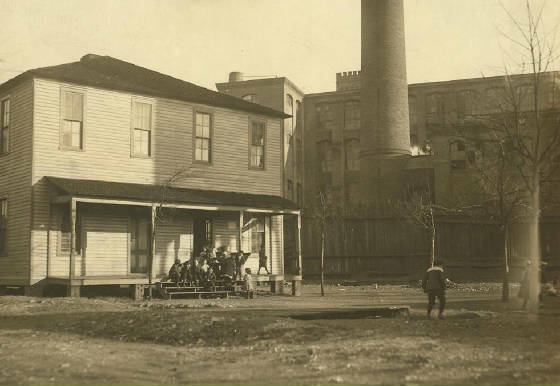 Lewis Hine caption: “The Mill School” at Avondale. The mill gate is but a few feet to the right of the photo and the employees pass through the school yard continually. From all I could gather on the question, the school is only a makeshift, because the mill children go here only the eight weeks of the year to comply with the law. Attendance is irregular. In the lowest first grade, with a child of six years, were two girls of fourteen and fifteen who had been to school but two weeks in their lives. Location: Birmingham, Alabama, November 1910. JM: How far did Lonnie get in school? DC: He didn’t have a high school education. I don’t know how far he went in grammar school. He could read and write. JM: Were there things he was especially interested in? DC: He loved to help my mom work in the garden and her flower beds. He loved the outdoors. He loved to go fishing. JM: How tall was he? DC: He was kind of small and thin, I think about 5′ 6″. He stayed thin all of his life. In fact, he always looked about the same as he looked in the picture you sent me. JM: What did you think of that picture? DC: I thought it was adorable. I made some copies for others in the family. JM: This picture was taken to publicize the problem of child labor. Did it surprise you that he was working in a cotton mill at such a young age? DC: No, because there were so many kids working in the mills back then. JM: In his WWI draft registration, he is listed as living in Irondale, Alabama, and his occupation is listed as well driller. DC: That kind of sparks something in my mind. My mother’s father was active in well drilling, and so was her brother Frank. I had forgotten about that. JM: His employer is listed as Frank Cole. But his father is also listed as Frank. DC: Well, his Dad’s middle name was Frank. JM: Did your mother work outside the home? DC: She was just a housewife. JM: How far did she get in school? DC: I don’t think she finished high school. JM: Did she work in the cotton mills? DC: Yes, that’s where she met my dad. But I don’t know whether she worked there when she was young. JM: Were you living close to Lon at the time he died? DC: No, but I would often hear the family talking about him. At that particular time, I was living in Detroit. I wasn’t able to go to his funeral. JM: Do you have any pictures of him? DC: No, I don’t. My mom had some pictures at one time, but we had a house fire, and they were all burned. JM: Do you still miss him? DC: Yes I do. We still talk about him. We talk about how we never knew when was going to show up. He’d just show up, and there he was for a while; and then all of a sudden, he was gone. JM: When he showed up unexpectedly, was that good news? JM: When he didn’t show up for a while, did you worry about him? DC: No. Everybody always knew where he was. Lonnie Cole, November 1910. Photo by Lewis Hine. Lonnie’s photos, especially the one above, inspired me to write a song about him. I decided to call it “Donnie Cole,” since that is what Hine incorrectly called him, and what most people who have seen the photos think his name is. I discussed this with his niece, the one who was interviewed for this story, and she agreed. The song is written from Donnie’s point of view, as if he is talking to Hine while he sets up his camera. The lyrics are posted below. In December of 2011, the song was performed at a concert by the Drury High School chorus. The school is in North Adams, Massachusetts. In addition, three seventh and eighth-grade boys from the choruses at Drury and Greylock School (also in North Adams) recorded a version of the song at the Drury recording studio. In this recording, one of the boys is the lead singer, and he is backed by the two other boys. The live performance by the chorus has been posted on You Tube (see link below). The recording by the boys can be heard by clicking the link below. Thanks to the three boys; the Drury High School chorus; the director of the chorus, Aldonna Girouard; and the music technology teacher, Jamie Choquette, who also played the guitar on the recordings. My name is Donnie Cole. I work here every day. That’s what my momma say. Sometimes I sweep the floor. But, I don’t do that no more. Hey, Mister, who are you? And why you hangin’ ‘round? That thing looks like a camera. I seen one up in town. The boss man don’t like trouble. He chase you out the door. Mister, what you lookin’ for? ‘Cause he’s workin’ on the rails. Someday I guess he will. If that’s what you gotta do. I know what he’ll say to you. He ain’t breakin’ any rules. She don’t want me back in school.